The mango enjoys a unique status among the fruits. It is the most popular fruit of the tropics and is called 'The King of Asiatic Fruits'. It is cultivated in many regions of India and now distributed widely across the world. Mangoes are savored for their sweet juice and bright colors. People in India eat mangoes ripe, or use them in the raw green form in pickles or chutneys. Mangoes are rich in vitamin A, C, and other anti oxidants. There are over 100 varieties of mangos in India, in a range of colors, sizes, and shapes. Unripe mango is sour in taste because of the presence of oxalic, citric, malic and succinic acids. • Mangoes are rich in Vitamin A, C, and antioxidants that boost immunity and offer protection from premature aging. • Both ripe and unripe mangoes are good sources of dietary fiber that help to prevent constipation. • The green mango contains higher vitamin C content than ripe one. It aids in the formation of new blood cells, absorption of iron from food. • It contains essential minerals and anti oxidants like poly-phenolic compounds, flavonoids that help to protect against colon, breast, leukemia and prostate cancers. • It is an excellent source of Vitamin-A, alpha and beta carotene, that are required for maintaining healthy vision, mucus membranes and skin. Fact: Eating mangoes does not cause dysentery or diarrhea. Mangoes do not have any intestinal irritants, but the cause of such episodes is the bacterial infection that takes place while eating mangoes with contaminated hands or eating rotten mangoes infested with worms. Fact: Mangoes, like most other fruits, contain very little fat. They are a vital source of other nutrients like vitamins, minerals, fiber and antioxidants. During the season, mangoes can be eaten everyday without the fear of gaining weight. • Mango fruit can be enjoyed all alone without any additions. • Fresh mango cubes are a great addition to fruit salads and desserts. • Mango fruit juice blended with milk gives you delicious "mango-milk shake". 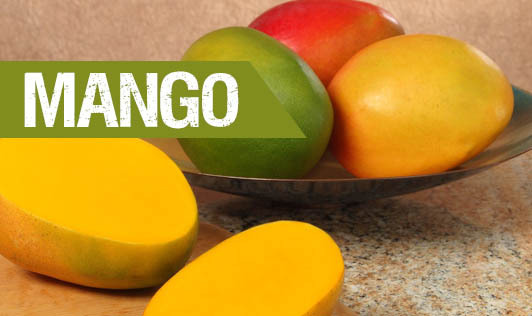 Mango fruit can be also used to prepare jam, ice- cream and candies. • The green mango can be used in the preparation of pickles, chutney and curries.